In a few weeks, many couples will be walking hand in hand, nibbling on cream-filled chocolate hearts together, clinking champagne glasses, and staring into each others eyes across a candlelit table. Making plans to create these special Valentine’s memories, however, isn’t always easy. But with Refine MD’s assistance, we can help you make it a day to remember! The first step is to make a strategy in advance. Decide if you will be going out on the town or preparing an intimate dinner at home. Whether it is dining out or at home, you will want to look your best. Refine MD offers a variety of skin care products for men and women that will make you feel refreshed and renewed on Valentine's Day. And ladies — don’t forget about our superior, award-winning Glo Skin Beauty Mineral makeup. After all, why not take advantage of the beautiful glow from the candlelight as it kisses your beautiful skin. Take a peek at all the products we have to offer online, or call us to set up a free consultation with our product specialist. A great way to start off the romantic Valentine’s Day is to do it the traditional way — send your sweetheart a bouquet of flowers. Our tip is to make sure you place your order way ahead of time — since this is one of the busiest times of the year for florists. If you want to really impress with those unexpected heartfelt gestures, then don’t stop there. Sprinkle gifts throughout the day. Send your special someone a delivery of gourmet chocolates, a decadent box of chocolate covered strawberries, or a bottle of their favorite wine. Then surprise them again by hand delivering a framed photograph of your favorite photo together and a gift bag of our Éminence Organic Skin Care products. Add our magnificently paired Strawberry Rhubarb Dermafoliant and Arctic Berry Peptide Radiance Cream to your Refine MD ladies gift bag and you will notice (as you gently caress your Valentine’s face) a smoother and softer complexion. As a reviewer on the Eminence website noted, after using Dermafoliant "My face feels baby smooth, even my boyfriend loves it :)". For men, choose the Black Mask from Revision. Skin will look and feel more polished and smooth from Revision's ingredients that include silt derived from European freshwater lakes, wood from larch trees, and the highest quality earth clays. Adding these items to your Refine MD gift bag will guarantee that lips will be ready to pucker up on Valentines Day. As the evening of Valentine’s Day comes to an end, wouldn’t it be great to give a gift that can last throughout the year! Something that every time your sweetheart uses it, they will think of you? A gift that will remind them of your memorable Valentines Day of 2019? A gift that will remind them how much you care for them and their happiness? 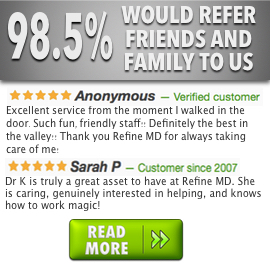 At Refine MD, it is our ultimate gift giving special — our Refine Returns plan. Throughout the year, your Valentine can choose what they want to use their benefits for — whether it is relaxing and pampering facials, member-only discounted botox, our array of high-quality skin care products, and more — giving them year-round access to the best medispa services and benefits. Give the gift of love and happiness — Refine Returns. Please stop in or call for more information. We are happy to help you with your Valentine's Day gifts. At Refine MD, we wish you and your sweetheart a Happy Valentine’s Day!